Mid-winter is perfect porridge season. 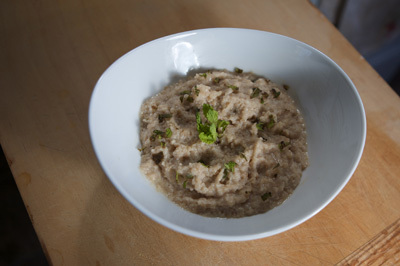 And as you all know, I love me some hot mush – like Earl Grey Oatmeal or Thai Rice Porridge. This newest creation is just as delightful, with hints of spring that are just enough to tease of the coming green . . . a few months down the road. The fresh mint is key here. Luckily, I brought my little bush indoors for fall, and it’s managed (just barely!) to keep on kickin’! Assorted add-ons, like alt milk of choice and brown or cane sugar / maple or agave syrup. In a small sauce pan, mix cereal and water and bring the to a boil. Reduce heat and simmer until thickened and ready, about 3-5 minutes. You may want to stir a few times to prevent sticking. While the cereal is cooking remove the peppermint leaves and dice them. Stir the peppermint into the finished cereal, just before serving. Top with your favorite alt milk and sweetener (I like hazelnut milk and agave in this one). Enjoy while appreciating the rain, and dreaming of the spring! Typing on my iPod is such a pain – I meant to add that I might try this with lavendar since that is still holding strong outside. Hmm…it seems that I do not have any mint in my spicerack nor any earl grey tea. Any suggestions on other variations? @Salekdarling: Cinnamon! I know, it probably overused, but it is sooo good! Also, maple syrup is one of my personal favorites. This sounds wonderful, Sayward. I love porridge. On a practical note: in the Peace Corps I learned that for oatmeal you don’t really have to boil it. Just boil water in a kettle, pour it over oatmeal to cover, then put a plate over it to seal it in. After 3-5 minutes, it’s ready to eat. Saves sticky oatmeal at the bottom of your pot! @Eric – Oooooh yes, I have been doing (and advocating!) that for years now! So very much easier. Though funnily enough I have switched over to the stonecut groats (or somesuch…my sister orders them, I’m so not up on what they’re called LOL!) which requite overnight soaking and do need cooking. But they are absolutely delicious and so worth the extra time for me. @ Ginger Baker – I love the idea of lavender! Ooh, let me know how that goes! And yeah, I think the un-linked name is due to ipod. It just means the ‘URL’ field wasn’t filled out, I think. @ Salekdarling – Well, porridge is so customizable, it’s really whatever you can imagine. Any nuts, any dried fruit, spices like cinnamon, nutmeg, cloves, allspice, pumpkin pie spice, actual pumpkin pie filling, etc. I also love extracts like almond or vanilla. Coconut milk or dried coconut. For teas, any yummy black tea (irish breakfast? peach ginger? whatever!). People also really love chai, which I think sounds amazing. @ Eric Normand – Thanks, that probably uses a lot less energy. I’ll try that from now on! Oh and also, I do have green tea, I could attempt a breakfast with that. I’ll experiment. Sadly, my mint is hiding in my herb garden under layers of snow and ice. Until spring arrives, I will have to purchase fresh mint from the grocer to try this out. i use steelcut oats (‘groats’) as well, but i have a way to cook them that doesn’t require ‘soaking’ overnight (tho it is an overnight process), and doesn’t leave a messy pot. the night before, boil your water (like 3 cups), add your oats (like 1 cup), turn off the stove, and when the boiling has reduced to where it won’t boil over, put the lid on the pot and go to bed. in the morning, lovely ready-to-eat cooked oatmeal that dumps cleanly right out of the pot! divvy out as many portions as you want to reheat, put the rest in the fridge. i’ve found they keep for at least a week; enough to have oats every day for breakfast. easy eating the rest of the week, after the first night’s cooking!